IDOMENI, Greece (Reuters) – In muddy fields straddling the border with Macedonia, a transit camp hosting up to 12,000 homeless migrants in filthy conditions is the most dramatic sign of a new crisis tearing at Greece’s frayed ties with Europe and threatening its stability. For the last year, Greece has largely waved through nearly a million migrants who crossed the Aegean Sea from Turkey on their way to wealthier northern Europe. Now, on top of a searing economic crisis that took it close to ejection from the euro zone a year ago, the European Union’s most enfeebled state is suddenly being turned into what Prime Minister Alexis Tsipras calls a “warehouse of souls”. 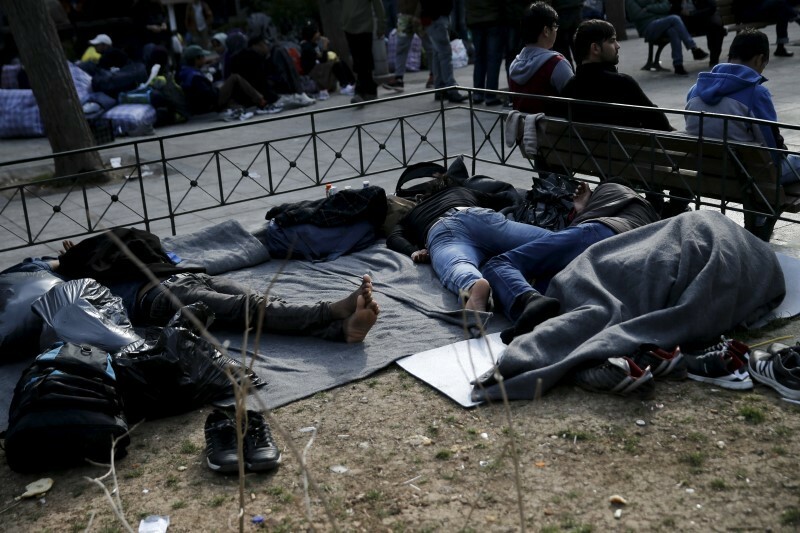 At least 30,000 people fleeing conflict or poverty in the Middle East and beyond are bottled up in Greece after Western Balkan states effectively closed their borders. Up to 3,000 more are crossing the Aegean every day despite rough winter seas. “This is an explosive mix which could blow up at any time. You cannot, however, know when,” said Costas Panagopoulos, head of ALCO opinion pollsters. Men, women and children from Afghanistan, Syria and Iraq are packed like sardines in a disused former airport terminal in Athens, crammed into an indoor stadium or sleeping rough in a central square, where two tried to hang themselves last week. The influx is severely straining the resources of a country barely able to look after its own people after a six-year recession – the worst since World War Two – that has shrunk the economy by a quarter and driven unemployment above 25 percent. After years of austerity imposed by international lenders, who are now demanding deeper cuts in old-age pensions, ordinary Greeks say they feel abandoned by the European Union. A staggering 92 percent of respondents in a Public Issue poll published by To Vima newspaper last Sunday said they felt the EU had left Greece to fend for itself. The poll was taken before the European Commission announced 300 million euros in emergency aid this year to support relief organisations providing food, shelter and care for the migrants. But such promises do little to soften public anger. While the EU and Turkey will struggle to find a consensus at an emergency summit on Monday on how to stem the influx of migrants, Greece looks set to become Europe’s waiting room for months to come. At Idomeni, a small border town in northern Greece, men from Syria held screaming babies close to a razor wire fence on Thursday, imploring Macedonian police they be allowed to cross. Greece says it is a victim of geography; some EU partners say Greek fecklessness forced them to reimpose border controls, putting the future of a border-free Europe at stake. “Its like watching a slow moving train wreck,” said Theodore Couloumbis, a veteran professor of international relations who is an expert on the Balkans and Greek foreign policy. Yanis Varoufakis, a former finance minister who took Greece to the brink of a euro zone exit last year by battling creditors over bailout terms, says the crisis was symptomatic of a moral, political and economic trauma in the EU. “Greece has been, as it always is, the weakest link in the organism and shows the biggest symptoms of disease,” he told Reuters. Facts and Opinions is employee-owned and relies on the honour system: enjoy one free story. If you value independent, no-spam, no-ads,expert journalism, support us with a minimum of .27 per story, a $1 day site pass, or $20 per year. Donate below. Please respect our copyright. Details here. 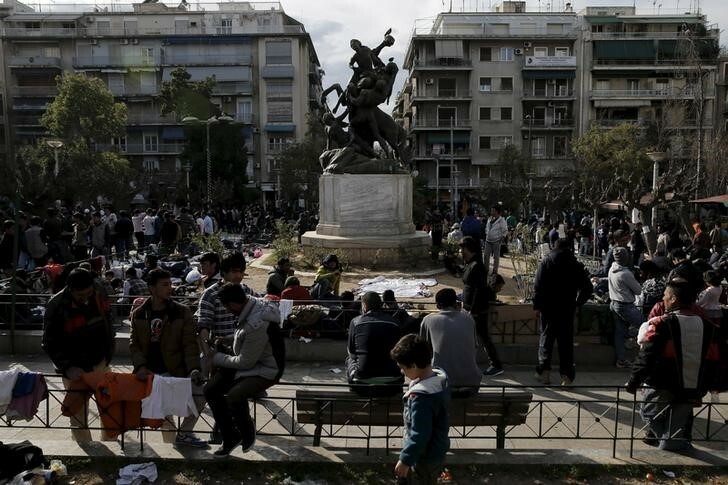 The initial response from the public has been an outpouring of generosity towards stranded migrants, although a neo-fascist party, Golden Dawn, which advocates forcing immigrants out of Greece, has captured 7 percent of the vote in recent elections. The migrant crisis threatens a nascent economic turnaround forecast in Greece from the second half of 2016, after six years of deep recession. Business leaders and the central bank have warned that the uncertainty could be a drag on the economy. The main uncertainty factor is stalled negotiations between Athens and its creditors – the euro zone, the European Central Bank and the International Monetary Fund. A first review of economic reforms under the bailout plan agreed last August, which Greece wants concluded fast to move on to debt relief talks, has been held up by disagreement among the lenders over how much more Athens needs to save in public spending, notably on pensions. Finance Minister Euclid Tsakalotos insisted on Thursday that cuts in basic pensions were a “red line” for the government. Publicly at least, nobody is making linkages between the refugee crisis and the bailout review or discussing trade-offs between the two, which are being handled separately. One of the most hawkish creditors, Dutch Prime Minister Mark Rutte told Reuters that while the EU should give Greece humanitarian aid, the bailout programme must be kept separate. Greece is funded till July when it faces bond repayments to the ECB, so there is no immediate financial pressure. But a worsening migrant flow could further complicate Tsipras’ attempts to sell painful bailout reforms to a public which already feels maltreated by its EU partners. And some policymakers in Brussels, Paris and even Berlin acknowledge that having averted a Greek exit from the euro last year, this would be the worst time for another Greek financial meltdown or political upheaval. Greeks don’t need much prompting to take to the streets. Mass protests are a regular feature in a volatile country of 11 million where pensions have been cut 11 times since 2010. Pollster Panagopoulos said he doubted the dual crisis would topple the government, but Tsipras might call another election — after two general elections and a referendum last year — if he felt in a deadlock. In mid-February, Greece briefly threatened not to sign off on final agreements at an EU summit on amending Britain’s membership terms unless Athens won assurances that EU states would not shut their borders. They did so anyway. Now Tsipras has hinted at using the veto threat again to ensure his country does not become a holding pen for migrants. “What I am seeking is the best possible outcome for Greece. Even if it means, to achieve that, using all tools provided for under (EU) conventions,” the leftist prime minister said in a television interview this week when asked if he could veto a deal between the EU and Turkey at a summit next week. How Greece and the migrant crisis are handled may resonate at the other end of the continent in Britain, where voters will decide in a June 23 referendum whether to stay in the bloc. James Ker-Lindsay, a Balkans expert at the London School of Economics, said leftist academics in Britain – a small but influential group typically supportive of the EU – were so dismayed by Brussels’ treatment of Greece in 2015 that it would not take much to alienate them completely. “If it looks like a double dose harsh treatment, the euroscepticism which is coming in very strong from right-wing parties across the EU could start being repeated on the left, but for a very different reason,” Ker-Lindsay said. Real journalism is not free. If you value evidence-based, non-partisan, advertising and spam free information, support Facts and Opinions, an employee-owned collaboration of professional journalists. We need at least .27 per story — and appreciate all sustaining contributions. Thanks for your interest. Details here.